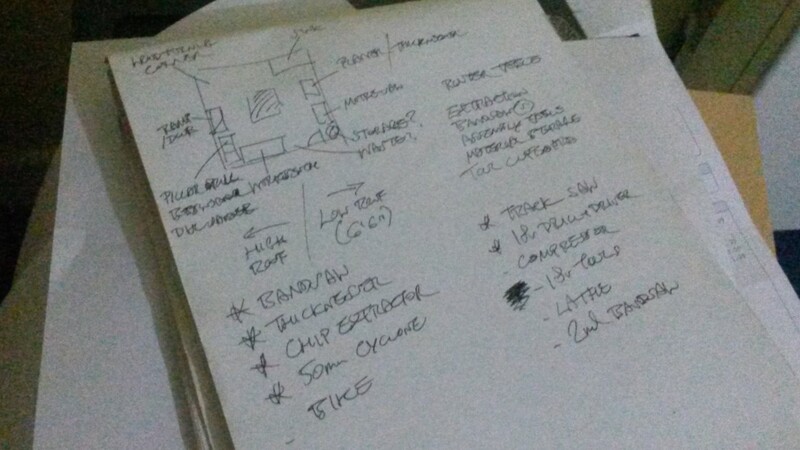 You know you’re looking forward to something when you find yourself plotting a potential workshop layout! Things are still yet to be signed, dotted and paid for as I write this but I remain confident regardless. In this post, I’ll be highlighting a few things I’ve since noticed and looking ahead to what will need to be done. I apologise for the lack of fresh photos to accompany this post – I wanted to take some on Thursday but the building is being used for storage at the moment, also meaning I won’t be able to move in before April. It’s in a fairly safe location and not as isolated as I’d felt the photos suggested. There is no restriction on working hours (all, of course, within reason). I felt it wasn’t quite as big as it looked inside but it remains perhaps double the size of my previous workshop. As the landlord has his own business, there’s the potential for me to take on work as a fitter. Should I need it, additional access for larger items is available through the neighbouring workshop. Lighting inside looks good and may not require improvement. With its low value, it is exempt from business rates (similar to council tax). All electrics are 230v, 13amp. I’d be looking at a three-year lease, with the option to give notice after one year. So, I’ve yet to come across any ‘red flags’ that have significantly affected my decision to go ahead with this. I feel quite anxious about moving in to an area that’s going to be more densely populated than I’d expected and having new neighbours, etc. But I really do need to find a workshop and in two-years of passive searching, this is the most convenient and affordable option I’ve found. Car insurance (which may require a ‘change of use’ written in to my existing policy). Contents insurance (one item I am supposed to be researching this weekend). Public Liability Insurance (to cover me working in someone else’s property). On top of all of that, I’ll need to be able to take away enough of a profit to allow me to pay for my basic living expenses, hopefully leaving further cash spare for investment in past-times and weekend adventures. 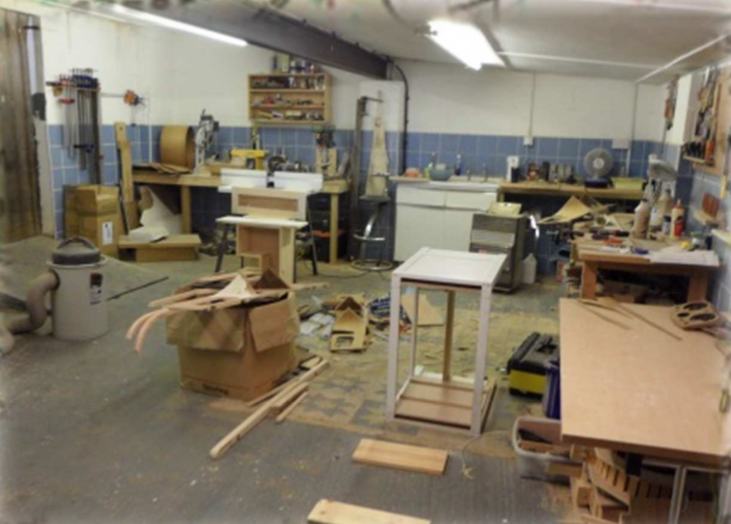 Bandsaw – a real workhorse in my last workshop, where I did not favour a table saw. Used for ripping timber before planing and for general curve cutting. I’ll need one (preferably 14in) to handle the rough dimensioning. Further down the line, I like the idea of owning a second, smaller saw set up solely with a narrow fine-toothed blade for cutting curves; leaving the larger saw setup primarily for ripping. Chip extractor – I still have a vacuum for dealing with very fine dust but I sold off my previous chip extractor in 2014. This is going to be essential for all planing operations, where a vacuum would fill up far too quickly. I have kindly been offered one but there are plenty of models going on eBay… I really like the idea of converting one to utilise a filter-free cyclone setup. Cyclone extraction – one of the first things I intend to buy and create is a small cyclone setup for my vacuum extractor. Something that would allow me to use it with power tools on the bench, as well as sanding and sawing machines. I did invest in a Triton Dust Bucket a few years ago but the filter on that clogs far too quickly and therefore, the system suffers a distinct drop in suction. With that in mind, I may one day require a second vacuum extractor, if I’m having to work away from the ‘shop, for example. Thicknesser – I still have the planer (jointer) that I think I purchased three-years ago and almost to the day. But a thickness planer is going to be essential. I have also been very kindly offer a ‘lunchbox’ style thicknesser on an indefinite loan. I’m not a big fan of those small but noisy things yet, it would get me going until I could find a more preferable option. Power Tool Storage – it’s one thing to be paying for insurance on your contents but down time could still be lost in the event of a break-in and theft. I intend to find a form of secure cabinet to keep them all in one place and not left out on the bench top. Perhaps I’ll also need something on wheels for transporting to and from different second-fix jobs. From what I was told, the previous tenant used a gas fire that heated the space rather well. My own preference is not to use one of them because gas ultimately gives off moisture which can lead to rust and corrosion issues on tools and machinery. Somewhere down the line, it may be possible to enquire about having a woodburner installed. Otherwise, I think I’ll be looking at electric heaters for the time being. I’ll be curious to see how an oil-filled radiator performed. It wasn’t at all bad in my previous single-car garage – main issues there involved a lack of space to use it and drafts up in the roof space. I’m reluctant to run a fan or convection heater permanently as that would cost a fortune. They may be okay for initial heat while the radiator warms up though. A halogen heater may be good for direct heat at the workbench and they are, by far, the cheapest of all electrical options to run. Any thoughts on what must be a common heating conundrum would be welcome. There’s no denying that a saw bench will rip through solid wood like no other machine. But with space at a premium, I have always resorted to alternative measures (favouring the bandsaw where practical). I have a temptation to buy a small table saw (like the Metabo PK200 I once owned) but, while that would be fine for solid wood, it wouldn’t be large enough for ripping an 8ft x 4ft sheet in two. If I’m going to own a table saw, it would have to be a dimension saw in size (or at least, style)… The catch here, however, is that I’m not yet convinced that this space would allow me to utilise one comfortably around other machines. An 8ft x 4ft sheet (2440mm x 1220mm) is impractical for me to handle alone, anyway. It’s most likely I would do as I used to and pay a small charge for the merchant’s to make two or three primary cuts so I could fit it in to my car. Even then, I’m thinking it might be better to using a circular saw and straight edge. For even greater accuracy and efficiency, I could look at something like the Festool MFT. Either way, I think I could add a plunge saw and guide rail combination (track saw) to my future shopping list. A track saw – as already mentioned but perhaps required sooner, depending on the type of work that comes in and whether I get in to fitting. Horizontal Belt Sander – I bought plans to make one of these several years ago but never got close to starting it. I don’t think it’s essential – although it would certainly be useful – but I like the idea of having a better space within which to build one. More Cordless Tools – it started with thoughts about a ‘need’ to upgrade my current 10.8v drills. From that, I’ve been considering buying an 18v kit (including a jigsaw and circular saw, among others), which would certainly be useful in the workshop and elsewhere. Drum sander – I have wanted one of these for a long time but a lack of space and finances always prevented a previous purchase. I wouldn’t consider batching out end-grain cutting boards without one. Domino jointer – this should require no explanation. I think I’ve done well to cover many of my the points I intended to share before sitting down to write this. If I try this for a year and it doesn’t work out for me then, well, at least I could walk away having said that ‘I have‘ tried it, instead of spending another six-years or more wondering, ‘what if…‘. Sounds like you’ve got it under control. Looking forward to hearing more about your new shop. Thanks, Andrew. I’ll keep you updated. How big is the shop, Olly? Exciting stuff … I have a plan to build myself a shop in the next couple years and I’m trying to determine how big to make it. Until then, I’ll live vicariously through your experience! For sheet goods, I started using a Festool plunge circular saw and rail and having looked back. It is as accurate as you make it: spend a bit more time, get a bit more accurate cut! Just lay down some semi-rigid foam insulation, lay the plywood on that, and make your cut! I love the idea of building your own shop and would always aim for something the size of a two-car garage, if not larger. But I think a square workshop could be more productive than a narrowing rectangular shape. Funny how people differ. The very first thing i bought was an old Wadkin AGS 10 for £150. It will accept a 12 inch blade for the odd cut (also stated in the manual), so i will make a 105mm deep cut. I have a small shop about 4,8 x 6,8 meters (32,5 square meters), yours would be 41 square meters, so a fair bit bigger. In my shop i have the Wadkin, a 16″ bandsaw, and combination thicknesser/jointer (Hammer A3 31 – £1800, so it took me 3 years to save up for that), a full size 1½ hp floor drill press), a lunch box thicknesser for initial planing of rough milled lumber, a wall mounted clamp rack that holds roughly 80 clamps, the Festool tracksaw (which was payment for a job i did), a slew of smaller corded and battery operated powertools and of course handtools and hardware. I also have a sheet goods rack, and a wall mounted lumber rack. I still have 3 big table tops, and room to put a full sized sheet of plywood on the floor in 2 places, plus room to rip or crosscut a sheet to any size on the table saw. So with an extra 9 square meters (almost a 100 square feet) you should be able to fit all the tools you mentioned, and have room for a nice assembly area. storage AND a table saw :). I made some simple infeed legs, that hooks onto my fence rail (somewhat like the ones Jay Bates on YouTube made), and an outfeed table, andi can honestly say, that ripping a full sheet is no problem. My only problem is, that i have to drive for 3 hours to get plywood, so i have to buy i bulk, so the rack i very heavy to roll out from the wall. That being said – it only takes 3 minutes. I’d be more than happy to make a short video workshop “tour”, if you’re looking for inspiration. Thanks for your comment, Peter. It sounds like you have a very desirable workshop! Do your machines run off three-phase? Do you have any other tips for handling full sheets on your own? Do you use one of those board carriers or lifters? I would always encourage people to upload a video and get involved with YouTube. There’s a great community of woodworkers out there, as I’m sure you already know, in mentioning Jay Bates. Hi Ashley, thanks for your message. Unfortunately, it fell through, despite having a verbal agreement. They pushed it back, delayed the move-in date again and now, it seems the landlord has decided to keep it for storage (at least, for this year). So, I’m looking elsewhere at the moment in the hope that I can find something else. It’s been frustrating and I imagine you and others might feel the same, having waited for news.